It goes without saying that the St. Lawrence River is a fundamental part of Montreal. La grande riviere du Canada dictated the spatial placement and development of the initial European settlement, fostered its growth into the major Canadian metropolis, and shaped the modern city in profound ways. And the river itself at Montreal – and the way Montrealers use it and move along, across, and above it – was profoundly reshaped by the construction of the St. Lawrence Seaway and Power Project between 1954 and 1959. Covering the impact of the Seaway on Montreal is a facet of my book Negotiating a River: Canada, the US, and the Creation of the St. Lawrence Seaway (which will be released in early March and is available for preorder). And those interested in further reading on the environmental history of this great city must pick up two recent works boasting a number of NiCHErs: Stéphane Castonguay and Michèle Dagenais, eds. Metropolitan Natures: Environmental Histories of Montreal (Pittsburgh: University of Pittsburgh Press, 2011); and Michèle Dagenais, Montréal et l’eau: Une histoire environnementale (Montréal: Boréal, 2011). 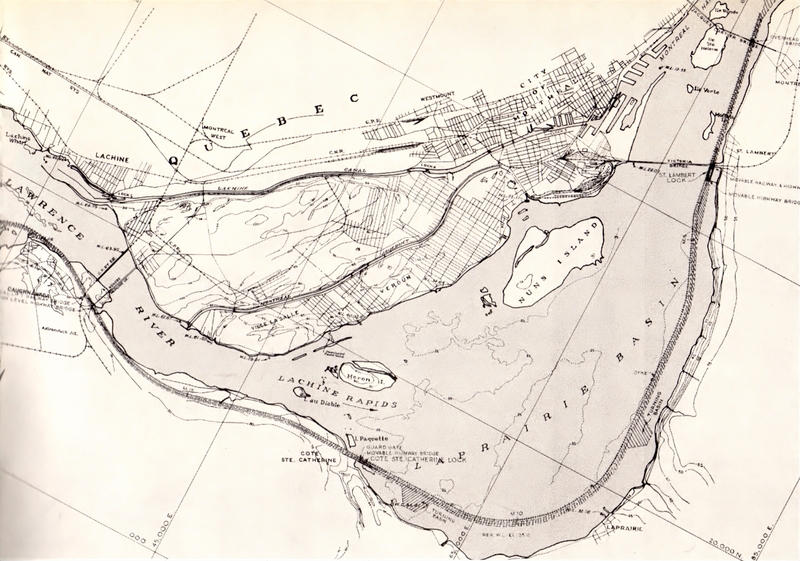 Map of the St. Lawrence Seaway channel and dyke on a pre-Seaway map of Montreal. © Daniel Macfarlane 2013. Throughout the 20th century there had been a good deal of opposition in the Province of Quebec to Seaway proposals, based on the fear that Montreal and Quebec City would be bypassed by river traffic and lose a great deal of their port and transshipment business. While that opposition likely represented a group of specific interests with a great deal of influence, by the early 1950s opinion in the province tended to be that a Seaway would benefit Quebec economically. This tendency was based on belief that Montreal, and the province in general, would benefit from shipping the recently-discovered iron ore in the Ungava region (which straddled the northern Quebec and Labrador border) to the steel factories of the Great Lakes region. A number of companies joined with the American Hollinger-Hanna group to form the Iron Ore Company of Canada, and this conglomeration of U.S. interests signed a development deal with Quebec in 1951, helping pave the way for commencement in 1954 of the long-delayed St. Lawrence Seaway and Power Project. The St. Lawrence project involved both a deep waterway and series of hydro-electric developments. Given that the hydro-electric dams (and the concomitant flooding) were west of the Montreal, it was the Seaway that had the major impact on the city. That said, changes to the St. Lawrence upstream would have affected Montreal’s water levels had control works not been built in the international section of the river and established methods of regulation to govern the water regimes of the St. Lawrence and Lake Ontario. The Seaway proper runs from Montreal Lake Erie, absorbing and improving upon the previously-existing Welland and Beauharnois Canals. 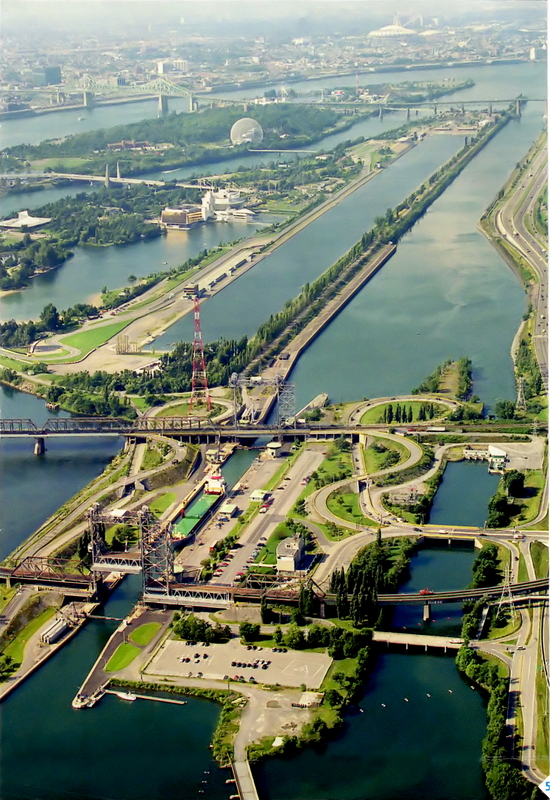 As far as the canalization aspect of the dual project was concerned, the Montreal area involved the most work and most expense, in no small part because of all the changes required to the infrastructure around and over the river. Until the early 1950s engineering plans had generally called for the Seaway channel at Montreal to run along the north shore. 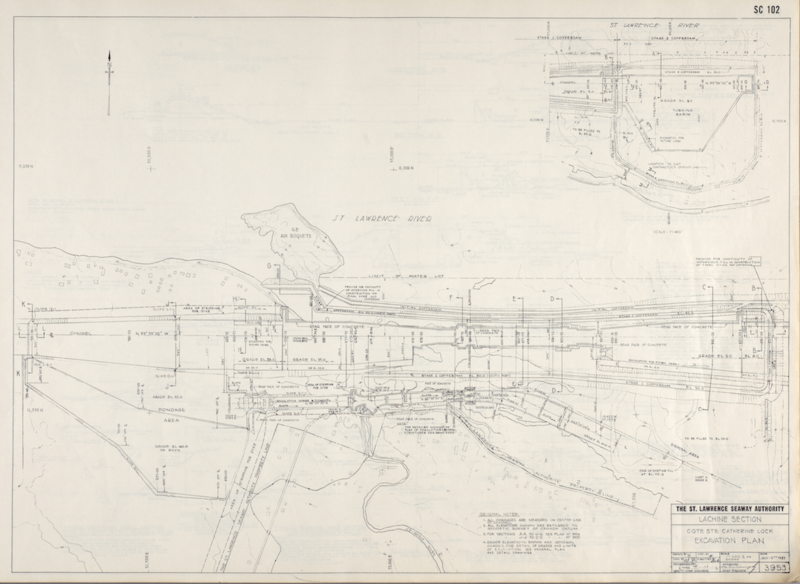 Earlier blueprints variously show the navigation channel running alongside Verdun (located west of downtown along the Lachine Rapids) and cutting through neighbourhoods further to the west. 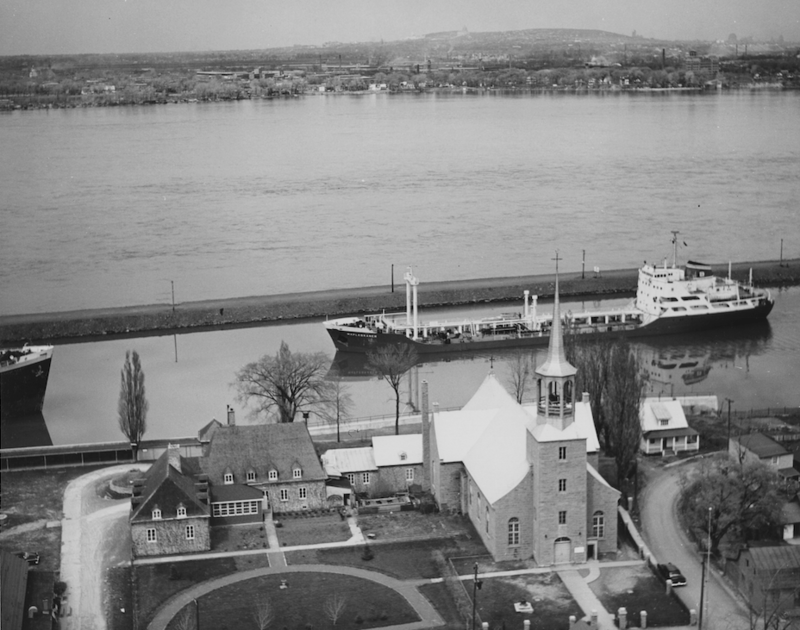 But before construction began in 1954, the location of the new deep waterway was shifted to the St. Lawrence’s south shore opposite Montreal. Government authorities had decided that it would be easier and cheaper to build a navigation channel along the south shore because of lower property values and less developed infrastructure. 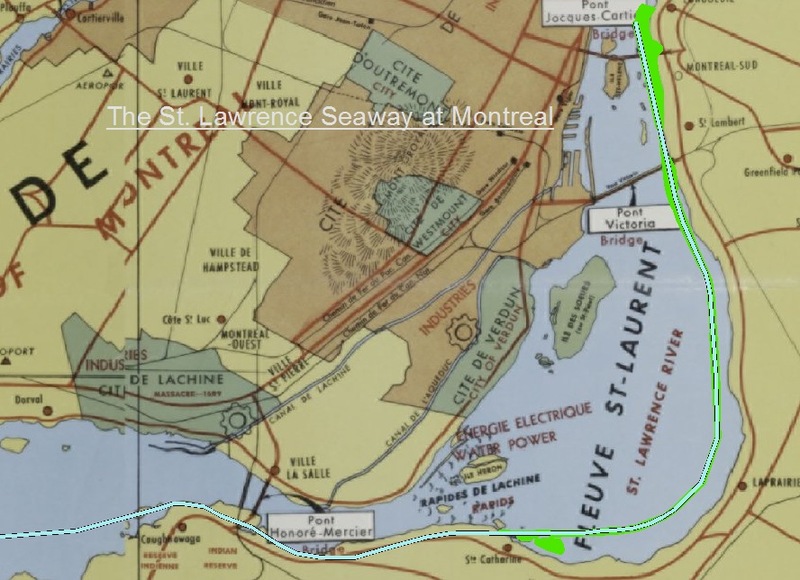 Locating the Seaway channel on the south side of the river can be interpreted, alternatively or simultaneously, as an attempt to transfer the costs of development onto more marginalized or less influential communities, or to disperse the benefits of development by bringing industry and development to other areas outside Montreal’s harbour area. Regardless, the Seaway channel cut directly through the Kahnawake reserve, severing it from the water and rapids that provided the community with its name, leaving a traumatic legacy in its wake. The final Seaway plans placed two locks in the Laprairie basin on the south shore. Directly across from the Montreal harbour was the St. Lambert lock, and at the foot of the Lachine Rapids was the Côte Ste-Catherine lock. Both of these locks were set off from the water by the 18-mile long Laprairie dike. Further upstream were dredged channels through Lake St. Louis and Lake St. Francis, between which were the Beauharnois power dam and canal (and its two new Seaway locks), and then on to the stretch of the St. Lawrence separating Ontario and New York State. Little did Montrealers know that neighhourhoods west of Verdun could have actually met the same fate as the drowned Lost Villages in Ontario. Since at least the 1920s plans for the St. Lawrence project had included a power dam flooding out the Lachine Rapids. In the 1950s, the Canadian government approached Maurice Duplessis, the Union Nationale Premier of Quebec, about developing hydro-electricity from the Lachine Rapids as part of the St. Lawrence project. But Duplessis claimed Quebec did not need this power at the time, as a burgeoning hydro nationalism inspired the province to start other dam developments in hinterland areas of the province, such as the Manicouagan and James Bay hydro projects. For political reasons, the Quebec government also declined to play a role in the Seaway construction, though it did agree to help create road tunnels under the new Beauharnois locks just west of Montreal. As a result, the Canadian federal government handled all aspects of building the Seaway in that province. The acquisition of property for the navigation works in the Montreal area was necessary before Seaway construction could begin. By August 1955, 127 expropriations had taken place for the Côte Ste-Catherine lock. Over 70 property owners had received compensation. The owners of property taken for the navigation aspect were offered current value plus 10 percent for inconvenience. In addition to relocations, the federal St. Lawrence Seaway Authority constructed collector sewer systems and several modern water intakes. But the municipality of St. Lambert complained, and a formal investigation started in 1958 was the next year extended to include other south shore municipalities that were also dissatisfied, such as Longueuil and St. Hubert. Complaints included the state of the water and sewer systems, the need for a protection wall, and the deprival of “an agreeable view” of the river by fill (e.g., dirt and rock dumped to form canal embankments) which also detracted from property values. The digging of the seaway channel lowered the water table, drying up many wells in the area, so the federal St. Lawrence Seaway Authority (SLSA) provided temporary water wagons. In addition to the actual navigation channel, many people were displaced by the numerous transportation infrastructure changes involved in reconfiguring the St. Lawrence basin. At Montreal a number of bridges needed to have 120-foot clearance for vessels. Achieving the requisite height required engineering breakthroughs. The SLSA was only obliged to build lift spans for Montreal, but realized that non-stationary vehicle crossings (e.g., lift spans) would induce unacceptable traffic blockages. The whole southern part of the Jacques Cartier bridge was thus raised 80 feet through an innovative jacking system, and in October 1957 a new span was inserted into the bridge. This process attracted engineers from around the world, and was done with a minimal interruption to traffic. The Victoria bridge was given a Y-configuration splitting the bridge with two vertical lift spans on each side of the St. Lambert lock. A new elevated span and approaches were added to the Mercier bridge. The city’s harbour received an expensive upgrade and facelift, including new grain elevators, wharves, piers, and sheds (over time, Montreal’s industrial harbour facilities moved further east away from the old port). Three bridges over the Beauharnois canal were given movable spans, in addition to the aforementioned highway tunnel under the Beauharnois locks. Despite subsequent claims that the project was a federal government initiative foisted on Quebec and that the Seaway hurt Montreal and province’s economy, studies have tended to reveal that the Seaway was beneficial for that province’s economic and port interests. In fact, the Montreal region may have actually benefitted economically from the Seaway more than any other Canadian area along the St. Lawrence. While the city certainly lost transshipment business, this seems to have been offset by the simultaneous rise in container shipping (which, ironically, was usually too large for the Seaway locks). Moreover, Montreal and Quebec undoubtedly profited from the exploitation of the Ungava iron ore.
Robert further contends that, nowadays, one “can almost say that Montrealers perceive the impact of the river on the city to be mostly limited to traffic jams caused by rush hour congestion on road bridges.” In her book Montréal et l’eau: Une histoire environnementale, historian Michèle Dagenais identifies as myth the perception that, in the postwar era, Montrealers became totally disconnected from the St. Lawrence and turned their backs on it. Dagenais shows that the city and its population have never really been totally separated, though the relationships and forms in which water was present did change over time. While the Seaway did not separate the city from the river fully, it is fair to say that it contributed to the increased alienation of residents from the river, privatized the shores. Indeed, there were noticeable ecological consequences. 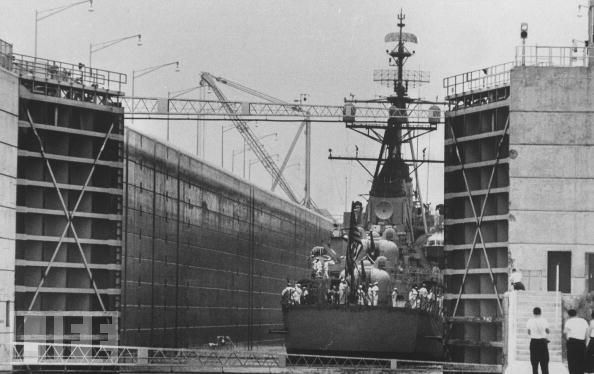 Both the initial construction, and then subsequent operation, polluted the water. Richard Carignan contends that the St. Lawrence river/seaway at Montreal is essentially now made up three separate rivers or ecosystems defined by differing water flows and qualities. After the completion of the St. Lawrence Seaway and Power Project, environment and technology became intertwined, even interdependent. Without seeking to downplay the negative ecological impact, it should not be forgotten that nature is resilient. Flora and fauna rapidly colonized the disturbed areas. Aquatic ecology rebalanced in response to the new circumstances. To the extent that such a distinction is useful, for the 21st century observer it can be difficult to separate the natural from the artificial when it comes to the St. Lawrence and Montreal. Note: this is a modified form of a post originally published on http://danielmacfarlane.wordpress.com/2013/12/20/montreal-and-the-st-lawrence-seaway/ and derived from a February 2013 presentation at the Rachel Carson Center. -Carignan, Richard, Positionner le Quebec dans l’Histoire Environnementale Mondialse/Positioning Quebec in Global Environmental History (conference), Dynamiques écologiques/Ecosystem Dynamics, Panel: Rivières & Fleuves/Rivers, Montreal, Quebec, 3 September 2005. Interesting article. But it ignores the socio-political costs of the Seaway on the Montreal canal neighborhoods. These where side by side English and French working class neighborhoods that were doing well enough from the work provided by the Northern Electric complex and surrounding industries.They were, at the time, Canada’s techno-industrial heartland. The class tensions that arose from destroying them so completely and quickly resonated for years, and are still being felt. Was it a coincidence that Pierre Laporte lived in St. Lambert next to the first lock of the seaway and Paul Rose who orchestrated his kidnapping, grew up in St. Henri and Ville Emard? We don’t know. But we’ll also never know what would have happened if largely anglo Griffintown and largely franco St. Henri has been sustained well enough to continue living side by side. So what if Quebec benefited economically? Montreal was the predominant political and culture center of Canada, and it suffered bad from the lack of foresight in managing the socio-economic repercussions of the seaway. Thanks for your comment, and for the great insights about the long-term impact on the surrounding neighbourhoods – that is not something I attempted to cover in this blog post for a variety of reasons, nor did I mean to imply that the impact of the Seaway was positive for Montreal as a whole (I go into more detail in the book, where I argue that the Seaway project as a whole was a mistake) but just for certain Quebec economic concerns (which is important to address because people often argue that the Seaway was bad for Quebec shipping and port interests, which was not the case). And I wanted to point out that the local costs could have been much more severe if a hydro dam had been built across the Lachine Rapids, as most people don’t realize how close that came to happening. Someone – perhaps you? – definitely needs to write a book on the long-term impact of the Seaway after its completion.